11.6.1881 in Poland near Kokarje, Fran Tratnik. below both seem to have the same title). Someone once said (or perhaps it was just me, just now), "An artist's work is the signature of their soul." Just as experts can tell a lot about a person simply by examining their handwriting, (particularly their signature), likewise many people (and not just art experts) who "love" a particular work of art, can tell a great deal about the nature of the artist who produced it. If the individual truly loves an artist's work, there will be a sort of metaphysical alignment between them and that work's creator even stretching back many centuries. In some ways one might think of it as similar to that between man and God. Best of all, inasmuch as artists, writers, and other creative individuals very often have much of their lives chronicled by art history and those who write it, there exists a reliable, and ever-more convenient, means of confirming such personal spiritual unity. 11.6.1881, in Poland near Kokarje, Fran Tratnik. Any artist who can produce two paintings in a single day as glorious as this and the one above deserves to be forgiven for tagging them with identical titles. "Love at first sight" may happen in real life, but I doubt if it occurs very often with art. Instant love is little more than an infatuation. Love, as applied to a work of art, takes time....time for that work to "grow" emotionally within the mind of the art lover. Only then will there develop an emotional kinship that extends to the creative genius who created such work. The paintings, drawings, and etchings of Fran (or sometimes Franz) Tratnik's art is a case in point. I rather doubt anyone would likely "fall in love" with a single glimpse of his work. Such work is, as they say, "an acquired taste" or, more precisely, "it grows on ya." More than just a painter, Tratnik was also a philosopher. 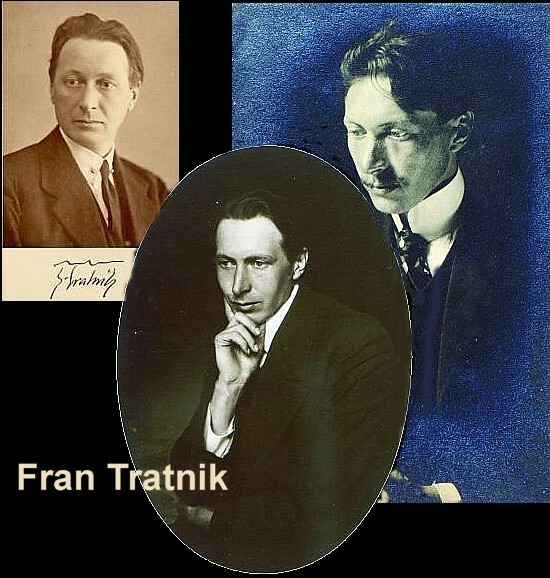 Fran Tratnik was born in 1881. Some sources list him as English while others refer to him as Slovene...or perhaps Slovenian. He was the fifth of nine children of Josefu Tratnik, a farmer and his wife who were also part-time potters, a raft builder (or ferryman), and timber dealer. (With nine kids, you need a backup plan). Fran grew up attending elementary school in his village of Gorizia. 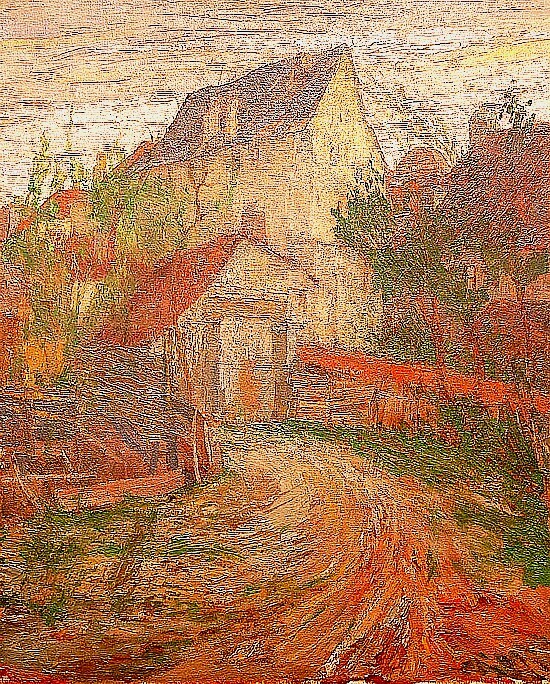 He graduated and then began studying painting and German at the age of fifteen or sixteen at the home of a wealthy benefactor named as N. Gosar in Celje, Slovenia. Gosar was supposed to prepare Tratnik in 1897 for the admission exam at the Prague Academy. Fran Tratnik spent 1898 alone in Prague. When he'd tried to sign in to Tamkajshnjo Art Academy, he was told he was too young. For a whole year, he studied alone. He was admitted the following year. 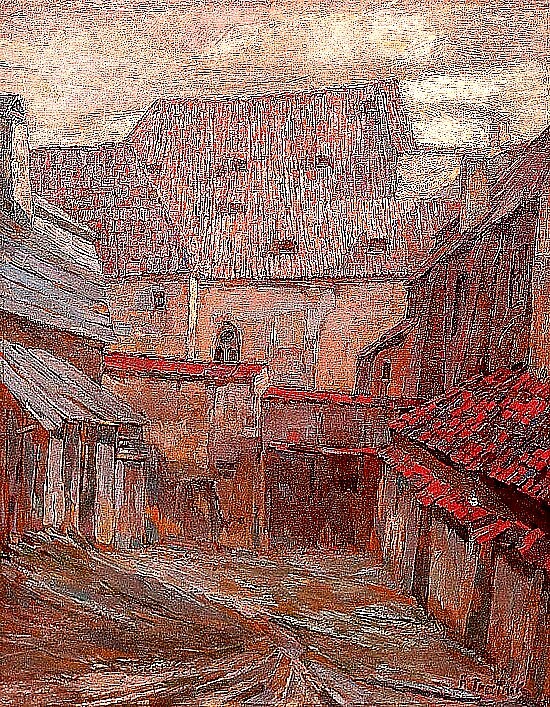 Tratnik studied under a variety of painters in a variety of styles in Prague. Due to his parents' financial difficulties Tratnik was forced to transfer to Vienna, where he studied under a schol-arship. However, he lost his sti-pend for neglecting his classes. From there Fran Tratnik moved on to study at the Munich Acad-emy in the years 1902-1903. There Tratnik joined their national art program. While at the Munich Academy Tratnik painted Pogor-elci (pogorishche, our birth vil-lage). 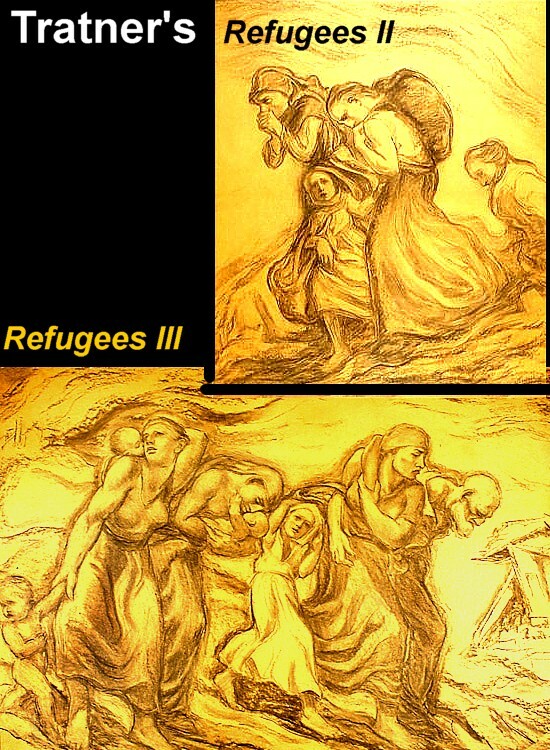 Refugees, II and III, Fran Tratnik, undated but probably after WW I. From 1904-05 Tratnik showed his work at numerous exhibitions in Munich, Prague, London, Rome, Celje, etc. 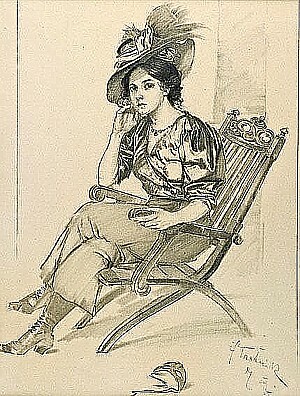 Tratnik mainly worked as an illustrator and draftsman during 1907-09. He moved to Munich in 1909-12 though he was active in Prague. 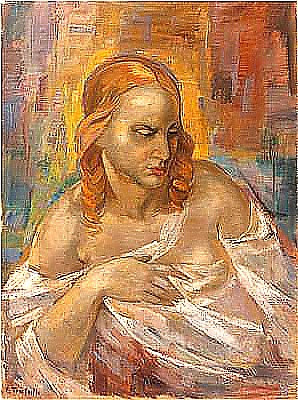 Subsequently Tratnik worked as a freelance artist; later employed as a restorer at the museum in Ljubljana. His work consisted mainly of portraits in oil, drawings, which dealt with social issues, and poverty, which he repeatedly traced to memories from his village homeland. Tratnik grew up on the banks of the Dreta, in the small village of Potok, which is only a few hundred inhabitants. The poverty and suffering he knew during childhood, as artistic subjects be became the central motifs of his work. 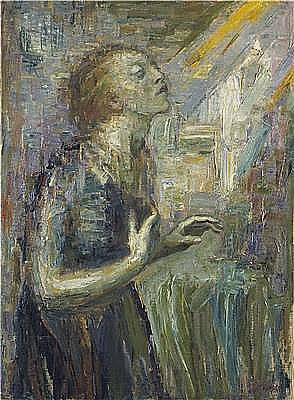 Fran Tratnik is regarded as one of the pioneers of Expressionism in Slovenia. 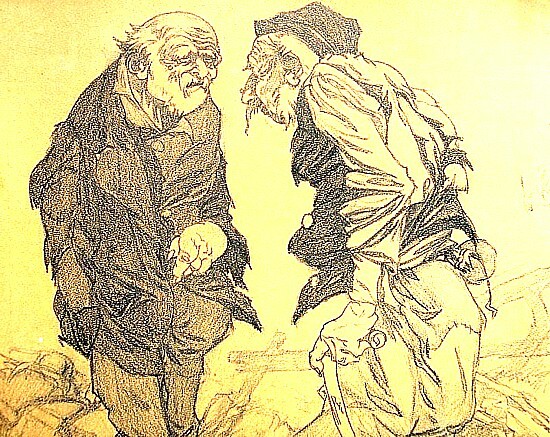 Two Old Tramps in Conversation (above), from the year 1909, can be explicitly categorized into the same area having to do with poverty and suffering. At that time, Tratnik had finished his academic education and already made a name for himself as an artist. Among other pursuits, he provided illustrations for the magazine Simplicissimus. From a slightly low vantage point, we see two elderly men who are excited about their conversation. Because of the ground and the partially executed background, it can be assumed that the two men have met in a field or outside a village. However, the fact that both men are not normal villagers is readily evident at first glance. Their clothing is sometimes far too big, and seems worn out, while the makeshift cane threatens to break at any time. Moreover the two have scraggly beards and warts on their faces. The swollen fingers of the man on the left makes them appear as tramps, who simply have other worries than outward appearances. Tratnik, in his mature period, evol-ved into a deep social chute-chega of satirical expressionism. He was influenced by the impres-sionism of Domachega and Cheshkega. In Tratnik's "social painting" we see a fine parallel with the literature of lvan Cankar, a pessimism as to his heroes, a despair and aware-ness that overcomes the current genius, a fatal Bulgarian curse. Fran Tratnik died at his home in 1957. He was seventy-six. As a side note, I'd have to say that this had been one of the most difficult biographical items I've even written. There seems to be no more than a few dozen words written about Fran Tratnik in English. All my references had to be translated from Slovene; and judging by the difficulty both Google and Bing have had in doing so, that language must be quite difficult. Usually their trans-lation aps are a godsend for crossing the language barrier, but this time as much as 20% of the Slovene text came back untranslated, often with such garbled syntax as to be totally useless. Thus some of my text may be ambiguous and questionable at best, if not just plain wrong. Therefore, I encourage anyone familiar with Tratnik or the Slovene language who wish to correct possible errors, please leave me a note in the "comments" section below so I may make changes. Despite the difficulties, I've come to a sort of personal kinship both as to both the artist and his work, which seems to me to prove my initial point, as to gaining a deep understanding of the artist just from his work alone.